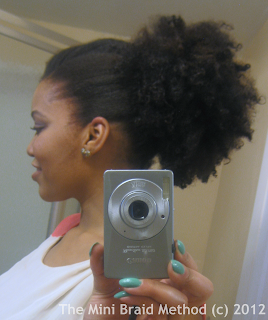 I've been natural for 3.5 years. My last relaxer was March 2009 and I BC'd in August of 2009. My biggest mistake was thinking that some things were just normal for my hair. I have extremely fine strands that are very fragile and prone to breakage. I thought breakage was just a property of my hair and something that I would have to put up with all my life. My hair really turned around when I realized I didn't have to just deal with it. I can prevent breakage by using protein weekly and using only my fingers to detangle. I keep my hair in braids most of the time. 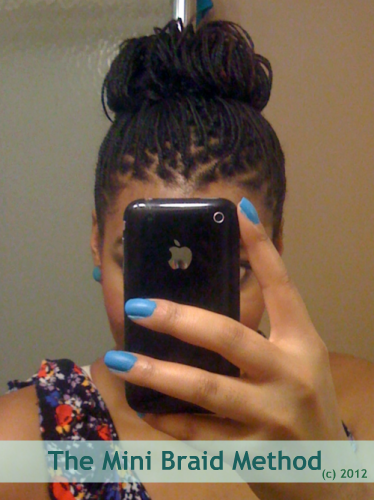 I prefer wearing mini braids with just my natural hair. I cowash at least twice a week with either Tresemme Naturals or Giovanni Nutrafix. I'm not loyal to any shampoos. 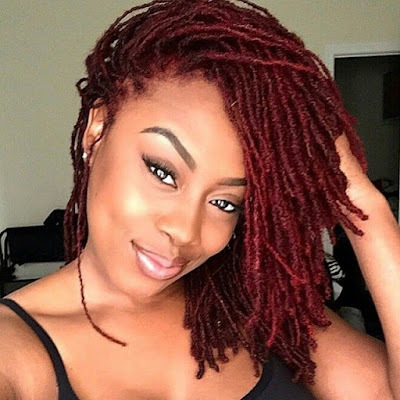 I don't shampoo often and I avoid sulfates- Bentonite clay is my preferred method of cleansing and I use it before and after I wear mini braids. I DC with LeKair Cholesterol weekly when my hair is loose and biweekly when my hair is in mini braids. I use Shea Moisture products as a leave in and seal with grape seed oil. I've recently added ayurvedic powders to my routine, which I use about every 6 weeks. I always struggle with this one. I start the day with good intentions but I don't stick to healthy body practices as much as I would like. I'm newly vegetarian (It's been about 8 months) and I end up eating far too many carbs. I'm still learning how to keep healthy foods stocked in my kitchen so I don't have to reach for something easy like some toast. I don't work out as much as I should but my plan is always at least 30 mins, 5 times a week. I have a muscular build so I see better results from intense workouts like kettlebell or interval training. One thing I'm good at doing is drinking water. I drink anywhere from 3-4 liters a day of pure water. The best advice I have is to learn what works for your hair and don't settle for okay. Always strive to have your hair in the best shape it can be. I would also advise not to compare your hair to others. My hair grows slower than average and it can be discouraging to see others reach milestones way before I did. I always had the longest hair growing up so it was surprising to find out that my hair grows so slowly. 6) Where can we find you (blog, youtube, tumblr, etc.)? 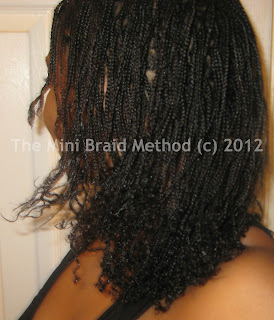 I have a hair blog on maintaining mini braids at minibraidmethod.com. I'm also on tumblr, which is my catch-all personal blog. Some things are NSFW. The address is jayneofalltrades.tumblr.com.